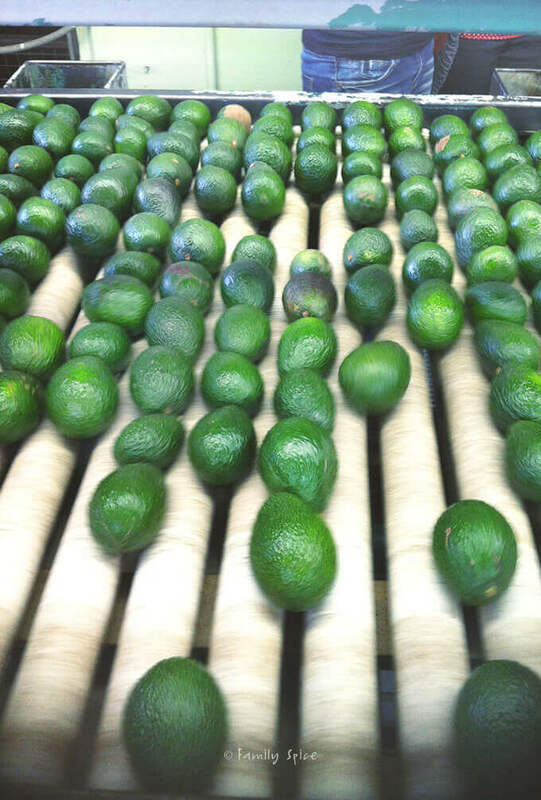 A visit to an avocado packing plant, avocado grove and historical Fallbrook, CA. 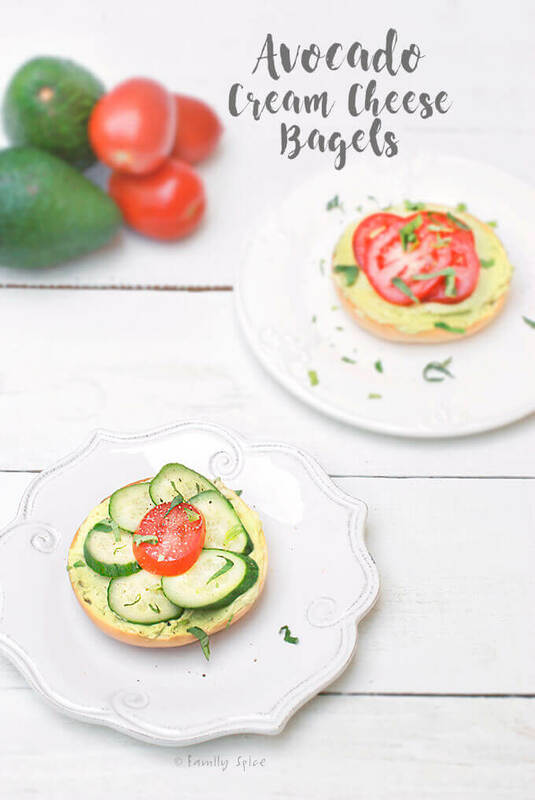 Plus, for breakfast or brunch: Avocado Cream Cheese Bagels. Weekends are a time to slow down, have a nice family breakfast, maybe even host a brunch with friends. With the kids and their schedule and multiple activities, the only time we can together with grandparents or other extended family is with a family brunch. Here in California, we love our avocados and we put it on everything, eggs, toast, tacos, soup, you name it. So I was excited when my friend Mimi/Mimi Avocado invited me to her avocado ranch and to tour a local avocado packing plant. But in my usual frazzled state, I ran out of the house without putting the SD card back in the camera after downloading a weeks’ worth pictures and creations. So, I found myself limited by using my old iPhone for video and pictures. But it was a bit liberating to be in the moment and not be a slave to my camera. Eco Farms is one of several packing houses that packs avocados they receive from local avocado farmers, like those from Mimi’s ranch. 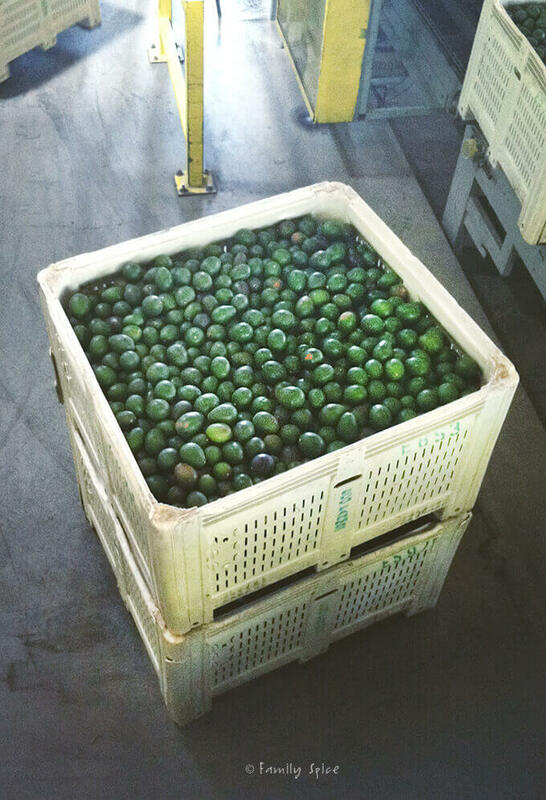 Eco Farms is where the gorgeous avocados chosen to be sold at Costco are sorted, packaged and sent out for distribution. Enola Price, from Eco Farms, guided us through the packing process and was kind enough to give us each a bag of these wonderful avocados. She happily pointed out that they were picked off the tree just one day ago. Now that is the meaning of FRESH. We watched as the avocados went through a visual inspection, and then sorted by size. 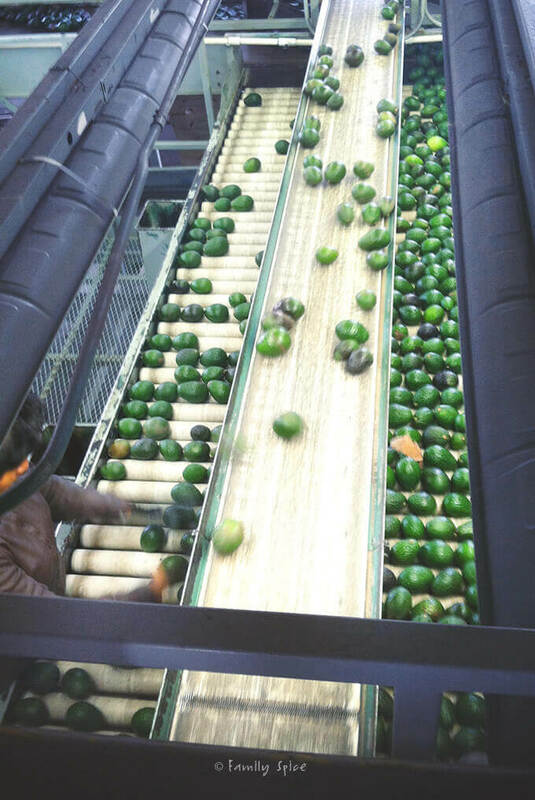 Each were labeled with a “California Avocado” sticker, which means that it is in stores less than a week after being picked, unlike the varieties from Mexico or Chile which take a week or two in cold storage just to get to the U.S.
Avocados do not ripen on the tree, but ripen once picked. It can take 7-10 days for an avocado to ripen after being removed from the tree. If you open a ripe avocado and see spots, then most likely it was an old avocado held in cold storage and not a California Avocado. I had such a lovely day and came home with so many beautiful avocados. You can get your own gorgeous avocados straight from Mimi’s farm. 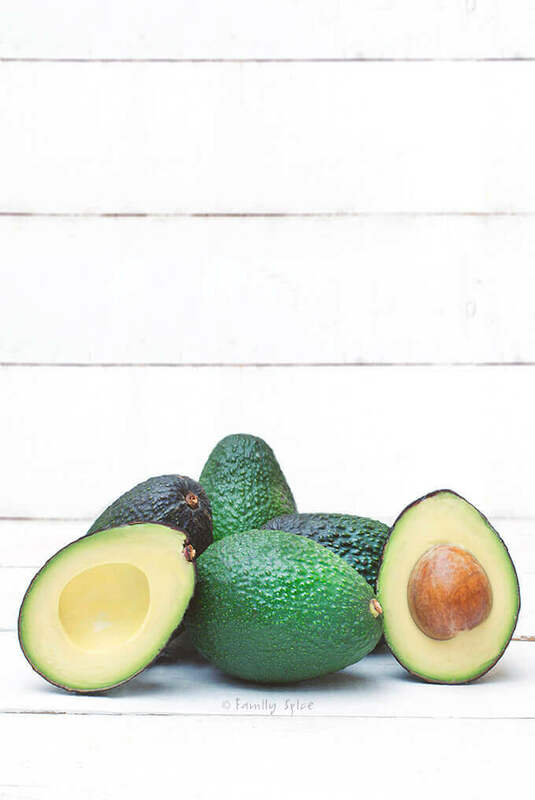 Their premium avocados are hand-picked, packaged into gift boxes and shipped through California Avocados Direct. To say that I had avocados on my mind while I prepared breakfast Saturday morning would certainly be an understatement. For these savory breakfast bagels I whipped up cream cheese with avocados and goat cheese to make a wonderful topping. It is an easy and a very forgiving recipe, allowing you to add as much avocado or cheese as your palette prefers. 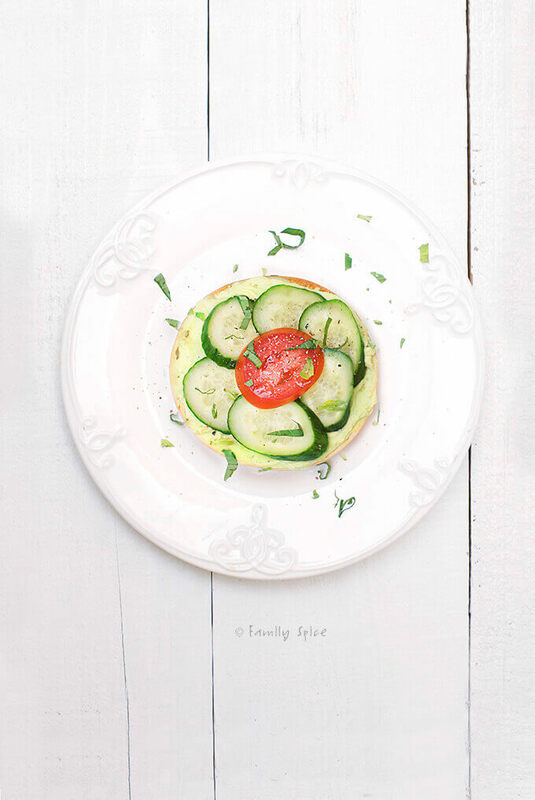 Topping it off with fresh cucumbers, tomato and basil finished our bagel sandwiches beautifully. You can also top your bagels with sprouts and radishes if you want a little bite in your bite! Using a hand mixer, whip the ingredients together until smooth and creamy, about 5 minutes. Serving Suggestions: You can also use this cheese spread on vegetables, like celery, cucumbers or peppers. Add other great toppings to your spread like capers, smoked salmon, bell peppers or other favorite fresh herbs. Hi! This sounds great. One question about the cream cheese/avocado mixture. Did you have any left over, and if so, how long until it turned brown, if at all? I did have some leftover. And it never turned brown, but the green is not as bright as it was the first day. The lemon juice prevents the normal browning that occurs with avocados. We’ve never tried mixing avocado with cream cheese! Great idea! (We usually just pile on the avocado.) Love the cucumbers and tomatoes too…so pretty! Let’s have another adventure soon! What a delicious, creamy topping for a bagel. Great breakfast idea! Glad it turned out so well. Love the bagel. One of my favourite breakfasts from March > October. Well, have linseed or flaxseed or quinoa toast as bagels are not as widely used in Oz! Sometimes baby spinach or rocket leaves and microherbs find their way atop also 🙂 ! Oohh so delicious! I’ve never spread avocado on bread! This is a very unique and delicious recipe to try! 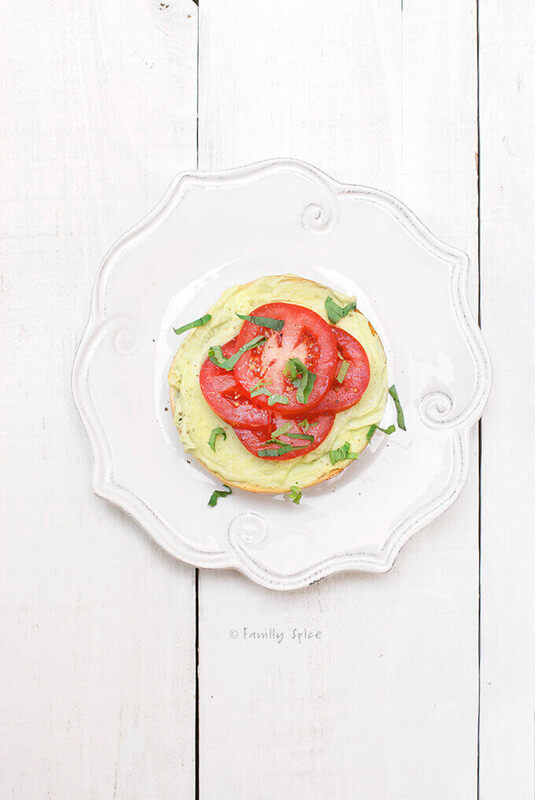 A wonderful avocado adventure and great breakfast idea! You did a great job. Love the story! Can’t wait to visit Mimi’s farm some day! Delicious! 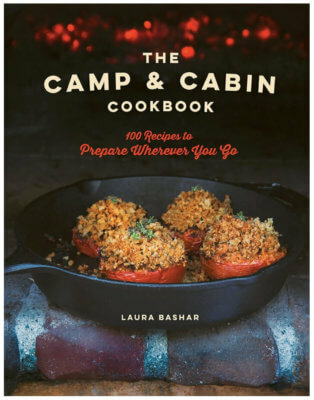 I made a vegan version – twice actually; once using Miyoko’s Kitchen Double Cream Chive (brunch) and once using Follow Your Heart Garden Herb (dinner the next day)!